The Columbia University Chapter of the National Association of Hispanic Journalists invites you to a screening of the PBS documentary series, Latino Americans. Filmmaker John Valadez, who helped produce this groundbreaking chronicle of 500 years of Latino history, experiences and contributions to the United States, will screen one episode of the three-part series followed by a Q&A. 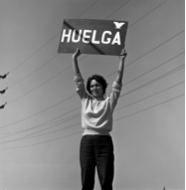 The episode, called Prejudice and Pride, traces the social activism of Chicanos in the 1960s and 1970s.